Ecommerce WordPress theme is creative, stylish, dynamic and stunning. It is made to serve all range of businesses from a small local grocery shop to a giant multipurpose retail chain. 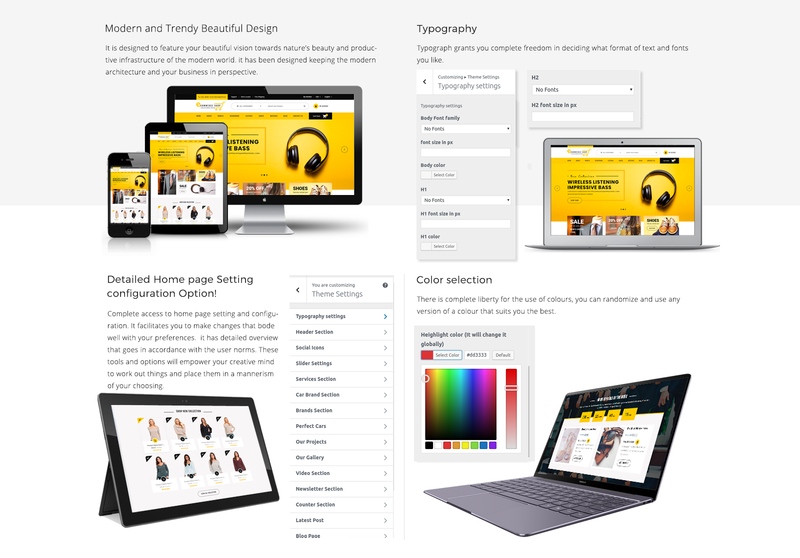 It is backed by multiple page and blog layouts, unlimited colours and numerous Google fonts to craft out a website of your desired look and feel within minutes of installing it. It keeps you away from the stress of coding as it is extremely easy to use and manage for webmasters and novice both. It is strengthened by WooCommerce plugin which sets up a beautiful platform to sell anything. This plugin is the soul of any eCommerce website and gives immense power to you to sell both physical as well as digital goods in many shop layouts. With so many tools and features working on your behalf, this eCommerce WordPress theme will take care of everything and will free you from tons of responsibilities that come with a website. It provides a vast additional space in the form of banner and sliders to show your uniqueness in decorating it impressively. Get priority fixing of errors with the premium membership provided with the theme. Ecommerce WordPress theme looks gorgeous on varying screen sizes with its responsive layout. Translate it into your local language with the files provided inside the theme package. It takes care of SEO to divert maximum traffic to your website. You can integrate your onsite business address with custom Google map making you easily available to customers. Social media icons are embedded in the theme making your content shareable on different networking sites. You can choose between boxed and full-width layout and decide whether you want sidebars or not. Short codes are provided that eases the work of including a feature without indulging in the coding part. With eye-catching Font Awesome icons, you can animate the website and gain some attention. Being an eCommerce WP theme, it is designed keeping in mind the needs of an online store like including a cart; providing drop down menu for cart and providing a safe and secure payment gateway for smooth transactions. 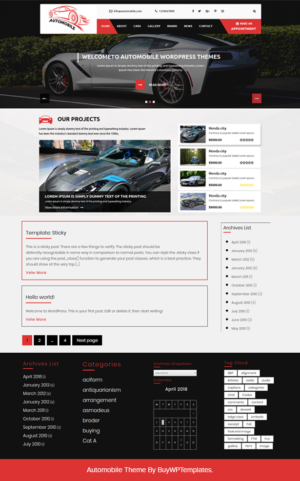 This purpose oriented theme comes with a gallery where you can show a glimpse of your best selling products. All the sections of this theme can be hidden or shown depending on your priority. This eCommerce theme is provided with access to customer support to solve your theme related queries ASAP with regular theme updates ensuring smooth functioning of your website.